Added the shoot reference prefix field to the ‘Import Shoots and Contacts From CSV File’ dialog. Improved our French translation for “Production Order”. Fixed a problem where two different warnings could be displayed simultaneously in the Email preferences screen. Fixed a hang that could occur when switch between shoot types that include multiple default resources. Fixed a problem with saving contracts and contract templates that were longer than expected. Fixed a crash that could happen when right-clicking on an empty row in the Outbox. Fixed a problem with upgrading to Light Blue 7 for some customers using older versions of Light Blue. Fixed a crash that could occur when dragging events in the calendar Day view when multiple resources are being displayed. Come and see Light Blue at The Societies’ trade show! We love meeting photographers and hearing how they’re using Light Blue to grow and streamline their photography businesses, and we’re going to be doing just that at The Societies’ 2018 convention and trade show, which runs from Friday 12 January to Sunday 14 January. 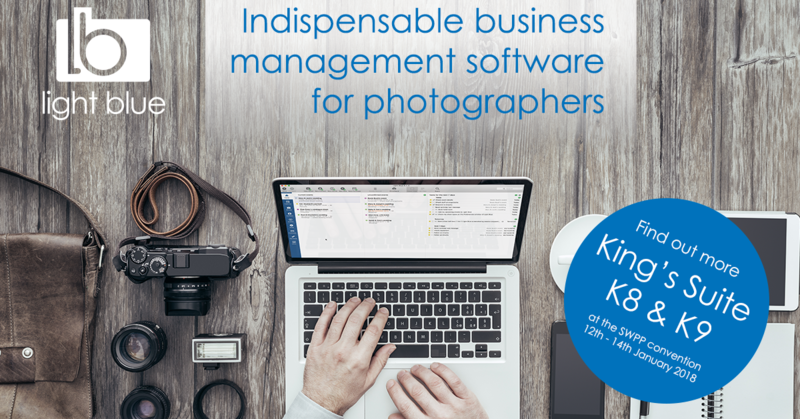 If you’d like to find out more about how Light Blue can help you to run a successful photography business, we’d be delighted to see you there. We’ll be running demos throughout the day on stand K8/K9 in the King’s Suite, and coming to see us at the show is the perfect opportunity to ask us any questions you might have about how you can put Light Blue to work for your business. We’re going to be running demos throughout the show for people who are new to Light Blue, but we love seeing existing customers so please come and say hello! This year, we’re also offering free one-to-one training at the show. If there’s anything that we can help you with, or that you’d like to talk to us about, you can book a free 20 minute session with us so that we can give you our undivided attention. We’re only able to offer a limited number of one-to-one sessions at such a busy show, so please make sure to book in advance to avoid disappointment. One of the things that makes The Societies’ convention much more compelling than many other trade shows is the extensive masterclass programme that’s running alongside the show. We’ve got acclaimed children’s photographer and Canon ambassador Helen Bartlett working with us on the Light Blue Software stand throughout the show, and she’ll be presenting a masterclass about how to find your own style of photography on the Sunday afternoon. There’s going to be dozens of other great speakers at the convention who are already using Light Blue to run their businesses, and we’ve put together a list of some of the highlights of the programme on our blog. The Societies of Wedding & Portrait Photographers convention is one of the highlights of our calendar. We’re looking forward to talking to photographers during the extensive trade show on the Friday, Saturday & Sunday. There’s a wealth of talks and masterclasses being held during the convention, and we’ve listed a selection that we think are well worth a visit! The exceptionally talented Helen Bartlett is giving a masterclass all about Finding Your Style in Family Photography on Sunday 14th Jan from 13.00 to 15.00. Since 2003 Helen Bartlett has built up one of the most respected family photography businesses in London. With an approach focused on natural pictures taken on location, and always in black and white, clients book her for her distinctive visual style. In this Masterclass, Helen will discuss her approach to photography and offer guidance on finding your own vision within your family photography work. This isn’t a ‘shoot like me’ workshop, rather a look at how to improve your own work, and focus your photography to help you build your brand and improve your business. Catherine’s going to be busy again this year. She’s an enthusiastic and engaging speaker and we’ve had the pleasure of hearing her share her knowledge and experience with audiences at a number of shows and conventions in the past. If you’re able to get along to (at least) one of her seminars, you’ll certainly find it worthwhile! Annie will be delivering A Beginners Guide to In Person Sales on Sunday 14th Jan. Eight years ago, Annie changed from selling online to her family clients and adopted an in person sales (IPS) model. Since then, she has seen a dramatic increase in business turnover. Annie’s Masterclass will cover how she transitioned from online to IPS, then progressed to employing a viewing consultant, and the benefits this has brought to her business. Julia established her photography business in 2005 and has since become one of the most well-known and respected portrait photographers in the luxury family market. With multiple awards under her photographic belt, she has looked after many notable clients from all over the world. Living in the highlands of Scotland Margaret has found a niche wedding business which is the mainstay of her business. However, she also shoots commercial images, being published regularly in Build it magazine and Homes and Interiors and Scotland on Sunday. Her landscape work of Loch ness has been recognised widely and she takes around 5 worldwide travel assignments throughout Europe and beyond. Lee will be sharing the experience of his legal training and his perspective as a photographer to deliver a couple of vital classes that will be of benefit for any professional photographer. John’s taken a particularly interesting and meandering route into photography and has some great stories to tell! He’s passionate about sharing his approach to working with light and models. If you can make it to one (or more) of his seminars during the convention, you’ll be sure to find it a worthwhile (and entertaining) experience! Vagelis is going to be exploring wedding photojournalism and explaining how he creates memorable images for his clients to treasure forever. With the strong emergence of mirrorless cameras on the market, photographers have never before had such a range of cameras to suit their needs to choose from. Ross is going to take you through his journey from DSLR to mirrorless. Jakob’s talk about Shooting Away from the Studio at Home and Abroad on Sunday 14th looks like it’ll be fascinating. Planning for an on location shoot can be as simple as taking your main body with a 24-70 lens with you and wearing your most charming smile… or it can be as complex as requiring a government-approved translator to explain exactly why hanging off of a 6th Century BC railing is justified ‘for the sake of the art’. Emma Joanne, principle photographer of Shotgun Photography has been shooting Weddings since 2010 and Gay Weddings since 2012, which she now specialises in. Scott’s masterclass on The Art of Bride and Groom Portraits on Saturday 13th will be valuable to many photographers. He will be giving a short Keynote on posing and lighting techniques, followed by a walk in and around the hotel to show you that amazing images can be had at ANY venue. Principal Photographer and Educator for Olympus UK – and one of the most decorated photographers in the world – Damian will be sharing his years of experience with audiences at convention. We get to enjoy seeing Damian speak at shows throughout the year and always find them enlightening, fun and entertaining. Lisa will be Demystifying the Networking Maze on Sunday 14th. Lisa is an avid networker, belonging to several local and national groups. She also gives presentations at these meetings, welcomes new members, and has set up and run networking groups for ladies in business. Today recommendations form the backbone of her established photography business in Norfolk. Commercial sports photographer Neil Shearer will lead an action packed day giving you the chance to shoot professional athletes in a state-of-the-art Crossfit Box. You’ll learn what’s involved in Shooting a Commercial Look Book on Thursday 11th. Magdalena will show you her recent Award Winning images featuring children and will also tell you the stories behind these images. You will discover how she works with children and how she poses them. Magdalena will also talk about how she styles each session using simple tricks without spending a fortune on props and dresses. Light Blue 7 is a major upgrade to our desktop app. 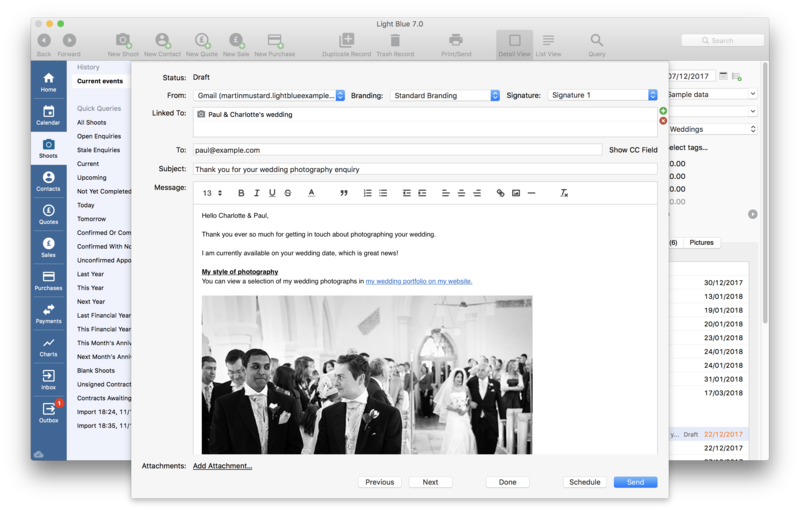 With improved email and text messaging features, a brand new charts section, expanded options for online forms, and a whole host of other new features and enhancements, Light Blue 7 is focused on helping you to communicate with your clients and grow your business. Subscribers can now send emails via Light Blue, and make use of great features like HTML formatting and being able to schedule emails to be sent in the future. You can also send emails directly to your Light Blue account, which makes it really easy to keep a copy of all of your clients’ correspondence linked to their records in Light Blue. 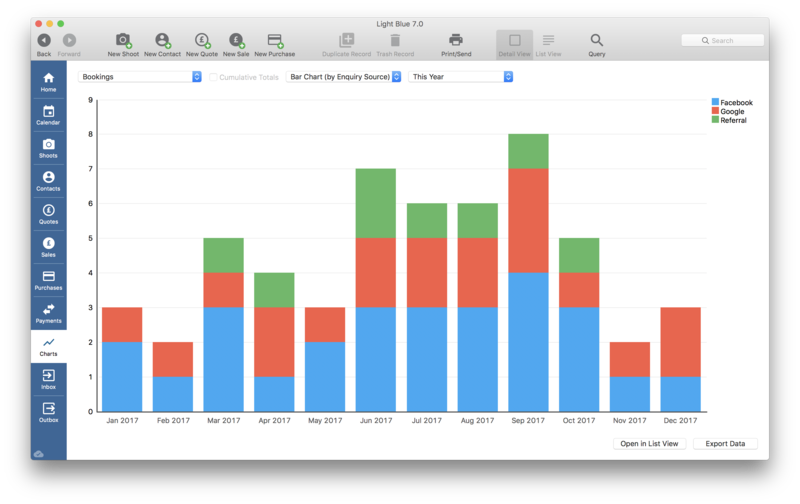 Light Blue’s reporting features have been enhanced with a new Charts section, which allows you to generate insightful reports that help you to grow your business in just a couple of clicks. Your client portal can now include multiple brands, allowing you to use different formatting and branding options for your forms, contracts, online invoices, and emails. Light Blue’s detail views are more customisable than ever, and you can simplify them even further to show just the information that’s relevant to your business. Behind the scenes there are thousands of tweaks and refinements to make Light Blue faster, better and more intuitive. You can read the full release notes here, and we’ve gathered together the video tutorials that cover Light Blue 7’s new features into a convenient group for you. Subscribers to Light Blue’s online services can update to Light Blue 7 by using the ‘Check For Updates’ command within the Light Blue desktop app. If you already have a Light Blue licence, but don’t subscribe to our online services, the best way of upgrading to version 7 is to add a subscription. As well as being able to upgrade for free, subscribers have access to Light Blue’s most popular features, including our online contract signing service, forms, online invoices, and our new email features. * Some of Light Blue 7’s new features require a subscription to our online services. Light Blue’s reporting features have been enhanced with a new Charts section, which allows you to generate insightful reports that help you to grow your business in just a couple of clicks. They’re really quick and easy to use, and give you an intuitive understanding of how each part of your business is performing. You can now send emails via Light Blue, and make use of great features like HTML formatting and being able to schedule emails to be sent in the future. Emails that you send via Light Blue are automatically saved to the Activity panel of the record that you sent it from, which helps you to keep a complete history of all of your dealings with your client together in one place. You can use a variety of HTML formatting options within the emails that you compose in Light Blue, and the emails that you send can also have your client portal branding applied to them. Emails can now be sent to your Light Blue account, which removes the need for importing them from Mail (on a Mac) or Outlook (on Windows). Each Light Blue account has a unique email address (e.g. 1234@lightbluecustomermail.com, you can find your account’s unique email address in the ‘Email’ section of the Preferences window) and any email sent to that address will be automatically imported into your account. Records from the main sections in Light Blue also have their own unique email address (which you can get via the options menu on each record’s Activity panel), and any email sent to this address will be automatically linked to that record. You can forward an email from a client to this address to import a copy of the message into Light Blue, and any emails sent from Light Blue will automatically include your unique email address in the reply-to header so replies from your clients will come back to both your normal email address and your Light Blue account. Text messages can now be scheduled to be sent in the future, allowing you to set up reminders in advance or prepare a campaign to be sent out at a specific time. Text messages can now be sent via a dedicated phone number. This is particularly helpful for customers in countries that aren’t supported by our existing text messaging service (e.g. the USA and Canada) because it’s available in a wider range of countries. You’ll rent a dedicated phone number from us, and any text messages that you send from Light Blue will come from that number. Replies will be imported into Light Blue’s Inbox, and you can also have them forwarded to your own phone. If you’re interested in this feature, please contact us for further details. You can now apply your own customisable tags to Shoot records, and use those tags to quickly find a batch of records. Light Blue’s detail views are more customisable than ever, so you can simplify them even further to show just the information that’s relevant to your business. We’ve also added new types of custom fields (custom text fields can now be turned into single line fields, paragraph fields, comboboxes, or checkboxes) and added an option to move your custom fields into their own tab to free up valuable space in the Shoots and Contacts sections. We’ve added a trash can feature to Light Blue where, instead of being deleted immediately, records from the main sections in Light Blue are moved to the trash. This gives an opportunity to restore those trashed records if you realise that you made a mistake. We’ve made Light Blue’s helpful ‘Duplicate Record’ command more handy by promoting it to the toolbar, so whenever you want to create a new record that’s similar to an existing one (e.g. setting up a new price list or form) then you can save yourself a load of typing by using this feature. We’ve also add a record merging tool that can help you out when you realise that you’ve accidentally ended up with duplicate contacts, bookings, etc. Light Blue’s record merging tool allows you to quickly combine the useful information from a pair of records. The macOS version of Light Blue 7 is now a 64-bit application, which should ensure that it continues to run well on future versions of macOS that reduce support for 32-bit applications. Light Blue now supports Hi-DPI screens on Windows, as well as Retina displays on Macs. You can now add checkbox fields to forms. Custom fields that have been set up to display as a checkbox in Light Blue will automatically display as a checkbox on your forms, and you can also add miscellaneous checkbox fields. You can now add popup menu fields to forms. The shoot ‘Location’, ‘Enquiry Source’, ‘Referral Source’, and custom fields can be displayed as popup menus in your forms by supplying a list of the options that you want to include in the menu. You can also add miscellaneous popup menu fields to your forms. Form fields can be hidden, by supplying a default value that will be imported into Light Blue when the form is imported. This can be applied to the shoot ‘Location’, ‘Enquiry Source’, ‘Referral Source’, and custom fields. You can customise the ‘Submit’ button’s text for your forms. Each form template can now have its own ‘thank you’ URL, which is used to take your client to the specified page when you use the form as a contact form. You can make clients confirm their email address by forcing them to type it twice into forms. Name fields in the contact sections on your forms are now optional. Shoot type menus on forms can default to “Select a type” to make your client pick something rather than just go with whatever your default is. When you’re adding a form to a shoot, you can now see which contacts will be included for each contacts section. This is a handy way of checking, for example, whether you’ve correctly labelled the bride and groom for a form that includes a ‘Wedding Couple’ section. We’ve also made it more obvious when a contacts section doesn’t include any matching contacts. We’ve added customisable versions of the %ContractURL%, %FormURL%, and %InvoiceURL% tags that you use in the emails that are sent when you publish a contract, form, or invoice. You can now specify your own custom link text (e.g. %ContactURL:Please click this link to open your contract%) and you can also specify a button that has the same styling as the submit button in your client portal (e.g. by using %ContractURLButton%, or %FormURLButton:Click here to open the form%). We’ve removed the automatic “preamble” text from the email we send you when someone fills in one of your public forms, to make the preview that appears in email apps more useful. We’ve added an optional email template that can be used to send a customised acknowledgement email to the ‘Main Contact’ of a contact form. Requiring a drawn signature (as well as a typed one) is now optional for contracts and contract templates. We’ve added a %ContactSignatoryFullNameAddress% mail-merge tag. We’ve added an option to the Day view, which allows you to split your calendar into one column per resource. This is particularly helpful for businesses with multiple photographers, rooms, etc, who want to easily see which times are booked up for each resource. The ‘All-Day’ part of the Day and Week views automatically resizes depending on the number of all-day events. The currently selected event is now more obvious. Enquiries are now more distinct from confirmed bookings. Days that aren’t part of the current month are more obvious in the Month view. The calendar can now be filtered by shoot type and appointment type. Displaying events from macOS calendars is now opt-in, to avoid confusion from newcomers who might think that they’re seeing duplicate events if they’re publishing events from Light Blue to a calendar on their Mac. Improved loading speed if you’re displaying lots of events from your macOS calendars. Appointments, time off, and calendar notes can now be duplicated from the calendar or Home screen. Added a “Personal” category to time off. You can now create calendar feeds that only show that you’re busy, without including any details for the events. This is handy if you want to give someone a feed that they can use to see when you’re available, without giving them any confidential information. You can now include Calendar Note records in your calendar feeds. You can now import shoots (as well as contacts) into Light Blue. This is helpful if you want to import historical data into Light Blue when you’re first setting it up, but it’s also helpful for anyone who wants to import a set of leads into Light Blue as shoots rather than contacts. Added an option to highlight shoots and appointments that are scheduled outside of your business hours, by colour-coding the event’s date and time. If the event clashes with another confirmed or unconfirmed event then that colour-coding takes priority, otherwise out-of-hours events are highlighted in purple on the Home screen, Shoot records list, and Activity panel. You can now specify multiple default resources for your shoots, so that when you select a shoot type you can now have multiple staff, rooms, and equipment added to the shoot. We’ve added a ‘Mark Found Shoots as Completed’ command to the Housekeeping menu, to help you keep the ‘Current Events’ list on the Home screen manageable. When you add a member of staff to a shoot, the ‘Role’ field now defaults to the job title that you set up for that member of staff in the Preferences window. Added a ‘Copy All Email Addresses’ command to the options menu on the Linked Records panel. When cancelling a shoot, linked appointments are now cancelled instead of deleted. We’re also offering to delete scheduled emails and text messages that have yet to be sent. We’ve added an optional ‘VAT Number’ field, which you can enable or disable in the ‘Finances’ section of the Preferences window. If it’s displayed, it appears on Contact, Quote, Sale, Purchase, and Payment records. When you link a contact to a Quote, Sale, Purchase, or Payment, their VAT number is copied across along with their name and address. If the VAT Number field is being displayed, it will also be visible on your printed records, and included in the ‘Export Financial Data’ and ‘Tax Report’ commands. When an address is linked to more than one record, the number of linked records is displayed and you can use the options menu for that address to quickly find all of the records that share that address. We’ve added options for including a contact’s notes, history, and to-do list in our built-in printing template. Added a ‘Default Website Label’ preference. Improved importing from the macOS Contacts app for contacts with company details. We’ve added “A Different Percentage Of The Balance…” to the list of options for the ‘Create Sale’ button on Quotes. We’ve added a ‘Calculate Net & Tax Amounts From Gross Total’ button to the purchase item editing dialog, as an alternative to typing in the net and tax amounts of the item separately. Added an optional product code field to price lists, sale items, and quote items. You can enable this feature from the ‘General Preferences’ section of the Preferences window. Added an optional production instructions field to sale and quote items. This is included in the new production order. You can enable this feature from the ‘General Preferences’ section of the Preferences window. 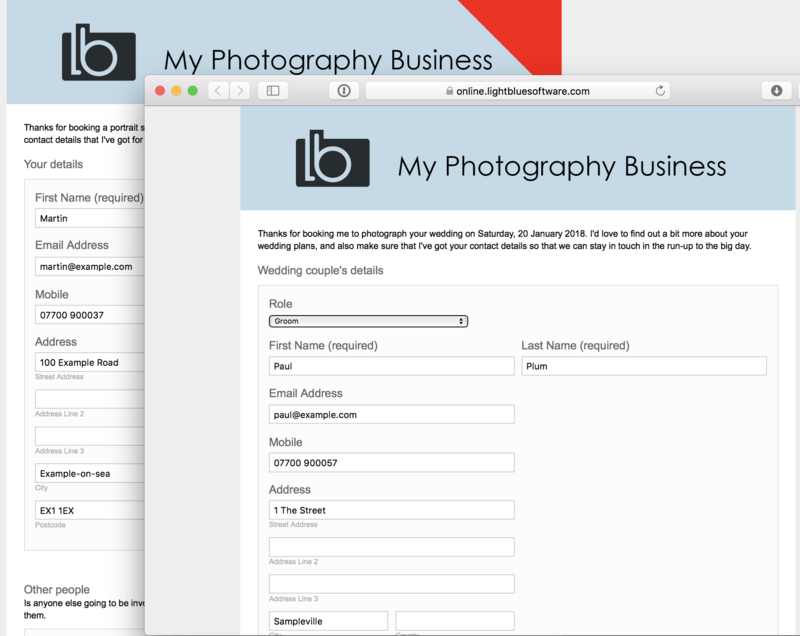 You can now track both the salesperson and photographer on Sale records. We’ve also added a new sample custom report called ‘Photographer Sales Performance’ that allows you report on each photographer’s sales. You can enable this feature from the ‘General Preferences’ section of the Preferences window. Added an optional production order, which is a new built-in template that can be printed or saved as a PDF from a Sale record. You can enable this feature from the ‘Printing’ section of the Preferences window. We’ve added an option to include a space for a client signature on invoices, production orders, and quotes. You can enable this feature from the ‘Printing’ section of the Preferences window. You can now choose to include your client’s primary phone number and email address on our built-in invoice and quote templates. You can enable this feature from the ‘Printing’ section of the Preferences window. Custom fields can now be included in our built-in invoice, quote, and receipt templates. When you’re invoicing a sale, Light Blue now warns you if the invoice date is older than today, or older than your most recent invoice date (if that date is in the future). You can now save a bespoke product from a sale or quote item to your price list. You can now select a different email template when you’re setting up an invoice for online payment. When you add a new contact to a purchase, we now default the Type field to “Supplier”. We’ve changed the default VAT reporting period for Ireland to four months. Added a method of bulk changing the Sale Status field to the Housekeeping menu. This is only displayed if you’ve enabled the Sale Status field. Sale Status-related quick queries are no longer displayed if you haven’t enabled the Sale Status field. Fixed a problem where, if the decimal separator is not set to ‘.’, applying credit to a sale would ignore the pennies. When using the ‘Export Financial Information’ command, if the contact name is blank we now include the company name instead. First name mail-merge tags (e.g. %SaleBillingFirstName%) now work when the name is a single word. You can now filter the Activity panel to show or hide specific types of activity. The Task Manager can now be filtered by task category. You can now reschedule a selection of tasks in the Task Manager to the same date. Documents can be exported from the Activity panel. We’ve added a ‘Bulk Delete Documents…’ command to the Housekeeping menu, which allows you to delete all documents with a particular file name from particular sections. This is helpful if you’ve mail-merged lots of large documents, and want to delete them to free up some disk space. Added ‘Received in the last 3 months’ and ‘All received dates’ options to the filter menus. The Inbox’s count of unprocessed items is no longer limited to items from the last 28 days, because you can now display items of any age in the Inbox. The default action for emails and text messages in the Inbox is now to preview the message, instead of linking it to a record. You can now create a new contact record from an email in the Inbox, as well as being able to add a new enquiry. When you import a contact form submission that only includes contact details, Light Blue now gives you a choice between importing just the contacts or linking them to a new enquiry for you. When you accept an online invoice payment via the Inbox, creating a Purchase record for the transaction fee is now optional. We’re no longer creating the ‘Light Blue incoming emails’ folder in the macOS Downloads folder if you haven’t enabled importing emails from Mail. Added a link to our mail-merge documentation to the Contract Templates, Document Templates, Email Templates, and Text Message Templates sections. All of the text that appears on forms can now be translated. You can now specify the words that will be recognised by Light Blue for “weddings”, “bride”, and “groom”. When you’re typing in a time field, Light Blue is better at preserving any minutes value that you’ve typed if you edit the hour. Saved queries, custom reports, data exports, and import orders can now be renamed in the dialogs that you use to load and save them. Improved the efficiency of the ‘Backups (Previous Versions)’ folder, by only keeping backups from the last five Light Blue upgrades. The ‘Export Records’ dialog now remembers that last set of fields that you exported for each section. Added a hidden feature to the ‘Export Records’ dialog, where holding the Alt key down while opening the dialog will export just the currently selected record. Light Blue’s static web gallery generating features are now hidden by default, because we’re planning to remove them in a future version of Light Blue. We’ve hidden our product workflows feature by default, because it’s not used by many customers and sometimes causes confusion to people who are new to Light Blue. We’ve changed the default left margin for your clients’ details on invoices, quotes, and receipts. Hardly anyone seems to use windowed envelopes now, so we’re now defaulting the left margin of their name and address to match the rest of the invoice. You can now specify a mail-merge template that will appear in the Print dialog for all sections, not just sales, quotes, purchases, and payments. We’ve removed averages from most of the reports that are available in the Reports menu, because they often didn’t add anything useful. Fixed a layout glitch that could cause the detail panel tabs to appear underneath other fields. Added an email template export / import feature. The ‘Export Records’ command is now renamed to ‘Export Single Record’ when you open the File menu with the Alt key held down, to make that hidden feature a bit more discoverable. On Windows, saves that trigger an immediate data sync (i.e. the app isn’t already syncing or waiting to do a data sync) no longer suffer from a delay before reloading the saved record. Added ‘Next’ and ‘Previous’ buttons to the template translation editing dialog. Added a ‘Mark as Completed’ / ‘Mark as Uncompleted’ command to the Task Manager options menu. On Windows, we’ve changed that way that Light Blue monitors its documents, template files, etc, for changes to make it more efficient. You shouldn’t notice any changes, apart from lower CPU and power usage.